The 78-year-old called police to say there was a burglary in progress at his home. 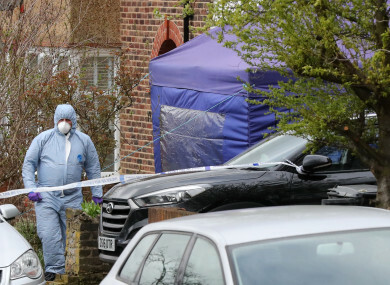 BRITISH POLICE HAVE arrested a pensioner on suspicion of murder after a suspected burglar at his home in southeast London was fatally stabbed to death. Officers detained the 78-year-old homeowner after responding to his call reporting a burglary in progress in the early hours of this morning and finding a man, aged 38, with a stab wound nearby, police said. “The 78-year-old resident found two males inside the address,” the Metropolitan Police said in a statement. One suspect, armed with a screwdriver, forced the elderly man into his kitchen when he discovered them inside his home in the Hither Green area, while the other suspect went upstairs, the force added. A struggle ensued between the homeowner and one of the men. “The man, aged 38, sustained a stab wound to the upper body,” the statement said. The stabbing victim was found collapsed in a nearby road by paramedics, who took him to a central London hospital where he later died, police said. The pensioner suffered bruising to his arms, while the second suspected burglar fled the scene prior to officers arriving and remains at large, the statement added. The dead man’s next of kin have been informed, and a post-mortem examination will be carried out “in due course”, according to police, who appealed for any witnesses to come forward. Neighbours said the area had seen a recent spate of burglaries, and the homeowner had been retired for “many years”. Adam Lake, who lives near the scene, said: “When I heard it was a burglary I wasn’t surprised, there’s been a noticeable increase in crime in the area. Lake added he felt sympathy for the homeowner. He doesn’t deserve to be punished for defending himself, and the neighbours that I’ve spoken to all agree that the priority needs to be to support him after everything that he’s been through. Email “Pensioner arrested for murder after burglar stabbed to death in London”. Feedback on “Pensioner arrested for murder after burglar stabbed to death in London”.